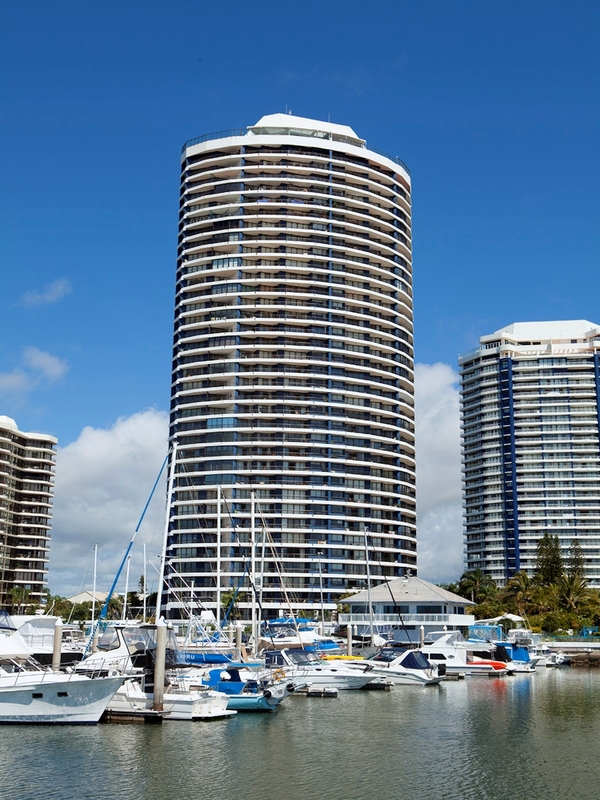 The premier high rise building in Runaway Bay (1984) occupies the best position within the complex (right on the Broadwater front). Comprising a total of 130 apartments on 34 levels. There are four apartments on a typical floor offering 2 different floor plans, with spacious areas ranging from 161.9m2 (17.4 squares) for two bedroom/ensuite apartments to 187.1 m2 (20.1 squares) for two bedroom/ensuite plus separate family room apartments. There are also six sub penthouse apartments and two penthouses in the building. All apartments have magnificent views. Of course like all the other buildings in this complex, Broadwater Tower residents enjoy state of the art security systems, regular security patrols and professional on-site management. For enquiries regarding apartment sales and rental units available please call Resident Managers Tony and Helen Shaw.